Blondie and Brownie: New Year, New Cheeses! This cheese picnic involved pick up stops at both East Village Cheese and Murray’s Cheese, two of my favorite cheese purveyors in the city. The prices at East Village Cheese can’t be beat (the wedge of Brie that I bought was twice the size of what you see in the pic above and only $3!) and I love the element of surprise. You just never know what they’ll have on sale. Murray’s is my go-to for the super fancy stuff. 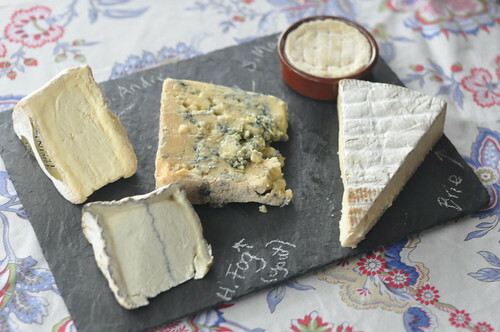 I picked up some favorites there like Cypress Grove’s dreamy Humboldt Fog, a chevre that even my goat-cheese-loathing mother-in-law could fall for, Cashal Blue, a mild and nutty Irish Blue and St. Marcellin, the super oozy and creamy wonder in the little crock above. I also nabbed a few new to me cheeses that will have to be repeated in 2013 for sure. That little round cheese in the top left corner is the Triple Truffle, a cavemaster reserve cheese from Murray’s that’s a quadruple cream with truffle butter (yes, you read that right, TRUFFLE BUTTER) in the center. Decadent and lovely, it’s hard to think of a better way to kick off the New Year. The Delice de Bourgogne was another huge hit with the family (it’s the round cheese in the bottom left corner). Super buttery and creamy, it went down easy with the French blackberry and violet jelly I picked up at East Village Cheese—how good was this combo? Lawman-in-law doesn’t eat fruit or jam, of any sort, and he found himself slathering both on a baguette with gusto. Last, but not least, the Harbison from Jasper Hill Farms in Vermont was a spruce bark lined cheese. Creamy (you can see it oozing out of its rind in the top right corner) and a little funky, this was Little B’s favorite (that’s my boy!). The only trouble with cheese picnics is they make you long for more cheese picnics. I hope another one is in my near future. 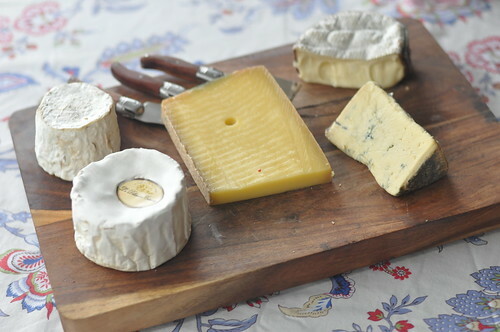 What other cheeses should I try in the New Year? No Woman from Beecher's. Jerk seasoning in, what I think is their Flagship. Great flavor and a little bit of texture from the seasoning. It's seriously delicious. Thanks for the recs guys! Those sound like awesome cheeses! I'm in favor of much more cheese in 2013! Red Hook's Country Boys Open a Restaurant! Brownie's Going to Austin! Where Should She Eat? Check Out Our Book Cover! Happy (Almost) Birthday to the King!